I wrote “Harada Sanosuke”. He was the captain of the tenth unit of Shinsengumi. Harada is two kanji symbols in right. It’s the family name. 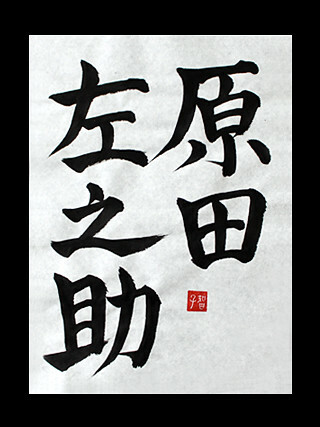 Sanosuke is three kanji symbols in left. It’s the first name. He trained in the spear technique of the Hozoin-ryu style, and usually used that weapon in battle instead of a sword.